Wow! Incredible Pink!! Who would have bet on this American singer and songwriter only a few weeks ago? Recently she was able to regain the number 1 position on “The Official Lebanese Top 20” with “Just Give Me A Reason”, after losing it to Mohammad Iskandar. Something no other artist was able to achieve before her! Furthermore, and after rising up to the top spot, she was also able to hold on to that position on the official Lebanese chart for yet another week (her 3rd in Total). Note that “Just Give Me A Reason” was chosen as the 3rd single from Pink’s 6th Studio Album “The Truth About Love” (2012). Pink featuring Fun’s lead singer Nate Ruess scores an average of 48 plays per week, and per radio station. From the 6 new entries of the week, “One Way Or Another” (Medley of Blondie & The Undertones songs) by British boy band One Direction is the highest one at number 11, followed by “Jayi La 3endik” from Georges El Rassi at number 13, “Mili Be3baki” at number 14 from Assi Hellani, and also “If I Lose Myself” at number 19 by One Republic. 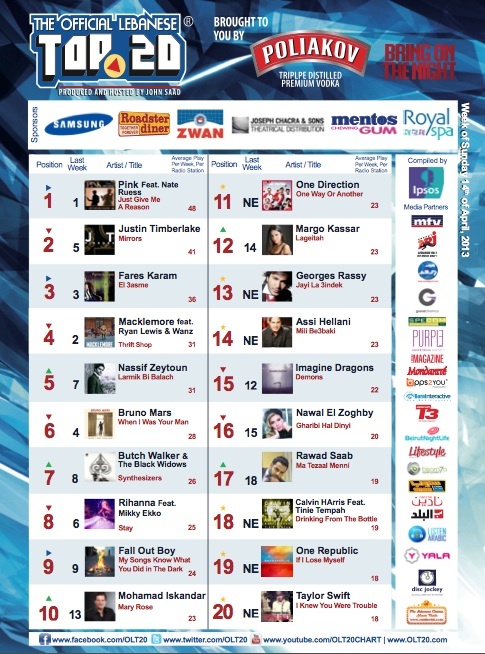 On OLT20 this week we have 8 Lebanese artists (from which only 3 are inside the Top 10), and 12 Occidental ones! Check the new & complete OLT20 chart by clicking on www.olt20.com now, or via the OLT20 App available for Download on all Platforms. Finally, note that OLT20 can be heard every Sunday from 6pm on Sawt El Ghad 96.7FM, and every Monday from 7pm on NRJ Lebanon 99.1FM ! – It is also played on daily basis as a compact Top 20 Countdown on MTV Lebanon, and published weekly via all our 21 Media Partners (Dailies, Weeklies, Monthlies, Online, Outdoor, OLT20 Mobile App, and on Location). Rock Band The Cranberries Back After 10 Years! An Epic Concert Event with Wiz Khalifa This Saturday, Don’t Miss It!